So maybe it’s Hallowe’en Eve and you’ve carved out a Jack-O-Lantern. Or perhaps it’s a cold winter night and you’re roasting a butternut. Or, it could be that you’ve just been fussing over a delicious slow-simmering batch of Indian Pumpkin Curry. Whatever the case may be, the scenario is the same: you have a pile of raw slimy squash seeds that seem too wonderful to waste. And they are! These little baby’s are carrying all the nutrients to build a whole new plant, including protein, zinc, iron, phosphorous, omega-3s, and Vitamin E. You can’t let all that goodness go the way of the compost pile! 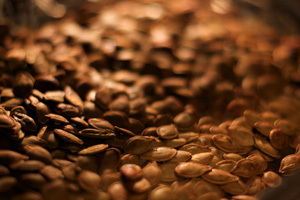 Toasted seeds are exceptionally easy to prepare. I always intend on cooking them up and eating them throughout the week, but their savory perfection and crunchy-munchy texture is just too much fun . . . they rarely make it past that first night! Scoop out all the guts and seeds and transfer them to a colander. 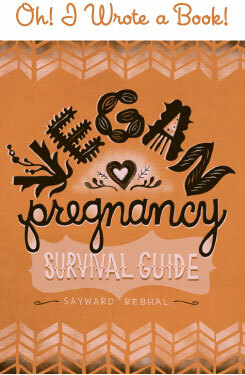 Rinse under warm running water, using your hands to separate the seeds from the guts, washing away all the goop. You want to end up with a colander full of clean seeds. 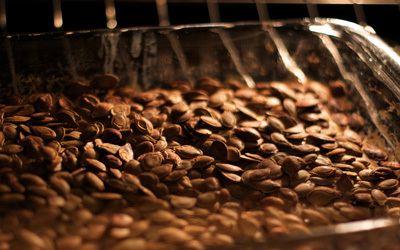 Spread the seeds evenly on a lightly greased cookie sheet or baking pan. Put the pan on the oven’s top rack, and bake for 15-20 minutes, until the seeds are browned to your preference. I usually give the seeds another sprinkle of Tamari when I remove them from the oven, but this is not necessary. Let them cool completely before digging in. ***At this point you can also toss in additional spices, such as garlic salt, Italian seasoning, or whatever suits your fancy. I usually don’t get too complex with these, but everyone’s tastes will vary. As always, experiment and have fun! Mmmm. I always forget that I could roast non-pumpkin seeds. I’m glad you linked back to this post!